(1939, Equity) Monty Rawlins, Betty Burgess, Larry Mason. This film is light years away from being a classic B western, but it's sooo campy you just can't help liking it. Yet, it does have some genuinely atmospheric scenes. 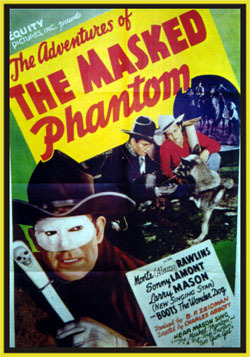 A masked lawman rides about the darkened countryside trying to track down a gang of cutthroats. In the Forgotten Horrors vein. A real party film. 16mm.